He chose ahead of time that he would praise God. No matter what! Psalm 56:4 In God I will praise his word, in God I have put my trust; I will not fear what flesh can do unto me. … 10 In God will I praise his word: in the LORD will I praise his word. Psalm 57:7 My heart is fixed, O God, my heart is fixed: I will sing and give praise. … 9 I will praise thee, O Lord, among the people: I will sing unto thee among the nations. Psalm 61:8 So will I sing praise unto thy name for ever, that I may daily perform my vows. Praise is an action best performed when the decision has been made in advance to praise God no matter what. Have you decided that you are going to praise God? If you did, how would that impact your music ministry? I have some friends who recently went through a deep trial as their son underwent treatment for stage 3 high-risk neuroblastoma. By God’s grace, Braden overcame the cancer, yet there has resulted from the treatments some hearing loss, specifically in the higher registers. 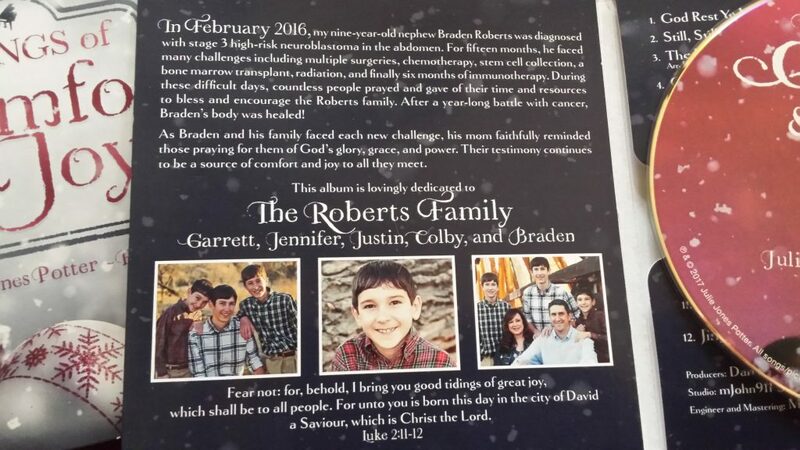 Braden’s aunt, Julie Jones Potter, recorded a Christmas CD entitled Tidings of Comfort and Joy to help raise funds for the necessary hearing aids Braden will get. For your convenience, I have posted it here on my site. Many have already purchased a CD directly from Julie, and thank you to those who have. If you haven’t, you may do so at the bottom of this post. All the proceeds through December will go to Braden. Dan and I are excited to share with you my new piano Christmas CD entitled “Tidings of Comfort and Joy” lovingly dedicated to the Roberts family. All proceeds this fall will be going to the hearing aid/medical fund of my nephew Braden Roberts. He has moderate to severe hearing loss in high frequency tones due to the chemotherapy he received during cancer treatments. CD’s are $15 each and includes shipping/handling. Local friends, we would be happy to deliver. Merry Christmas! Simply order below, and it will ship to you. All the proceeds will go toward Braden’s hearing aid / medical fund. Help me be a help to this family. Thanks in advance. This is NOT a digital download. It is a physical copy of the CD. CD will ship from Julie Potter. Shipping included. I arranged it for piano & strings for our Easter service this year. I’m grateful for how it turned out. You can jump over to the store to download it for free. Whether you just have one violin or a full strings section, I think the strings parts will benefit your singing. I pray that God will use it for His glory in your church. One of the great privileges of planning and leading worship in a church is to get a front row seat to how God is the great orchestrator of church life, specifically in using music to build up His church. Yesterday was another day that God put together two great services. “Every power on earth and in heaven is a shadow in his light. No authority, law, or government challenges his sovereign might. His reign and rule have no boundary. All that is his hands have wrought. God is in control, and He is using events to accomplish His purposes. Two weeks ago, I planned for the choir to sing an opener, but when we tried it in warmups, it wasn’t quite ready. We post-poned it a week. That following week, a lady attended our services who came up to me after the service. Her mother was dying, and the song we had sung was one of her favorites. She asked if she could have a copy of the music, thinking she may be able to use it in her mother’s funeral. On a national level, rest in and pray to the God who is really in charge. Trust in Him. In the church music arena, plan well, and work hard, all while yielding to and trusting in the God who uses your plans – and changes to your plans – to build up His church. Have you experienced similar divine fingerprints in your church’s music? I would love to hear your story! Comment here.